Are you looking for practices that will help you work with difficulties and obstacles in ways that can strengthen your resilience and add meaning to your life? Harvard Medical School psychologist, Susan David’s approach for building emotional agility has the potential for such powerful outcomes. When I am drawing on this material as part of a learning program, I prefer to ‘workshop’ it, that is, plan reflection or interactive activities that help people understand the value of the concepts, provide strategies for working with them and practices to make outcomes real and lasting. More on Susan David, PhD. David is a psychologist on faculty at Harvard Medical School, co-founder and co-director of the Institute of Coaching at McLean Hospital, and CEO of Evidence Based Psychology. 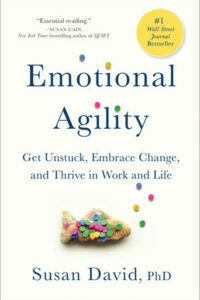 Check out her website for access to her book, Emotional agility: Get unstuck, embrace change, and thrive in work and life (2016), to take a free Emotional Agility Quiz, or to listen to her talks, including a popular Ted Talk that brings the concepts of her work to life. If you are new to her work, you may want to check out the Ted Talk first The Gift and Power of Emotional Courage.